A sports bike in its purest form. Reduced to the essentials. Agile, fast, suitable for A2 driving license and extremely sporty. Whether you are on country roads or the racetrack, the Moto3 genes are perceptible in every maneuver and convey pure race feeling. The handling – simply spectacular. The performance – incredible. The power – thrilling. BODYWORK & GRAPHICS: The sporty bodywork, footrests and pedals not just provide a unique supersport look but also help the RC to master extreme cornering with more leaning angle. HEADLIGHT: The twin headlight opens a new direction for KTM style and perfectly matches with the racing supersport look of RC. INSTRUMENT: The 100% digital LCD display has everything you could expect from a state-of-the-art KTM motorcycle, including engaged gear, fuel gauge and service reminder information. Just like supersport racing machines an RPM alert indicates when is the best moment for shifting up. INTEGRATED BLINKERS: As a special feature, the RC incorporates blinkers into the mirror structure, which not only look sporty but also contribute to the perfect aerodynamics. THIN TAIL: Fitting perfectly into the pure racing look the number plate holder rounds KTM’s high performance bike off. BRAKES: A state-of-the-art 2-channel Bosch ABS helps you get the most out of the impressive RC dynamics and adds the finishing touch to its peerless chassis qualities. The ABS on the KTM RC 390 monitors the effect of the potent brake system with radially-bolted, 4-piston caliper and 320 mm disc diameter - fun with no regrets. And for the stunt riders among us: The ABS is disengageable. 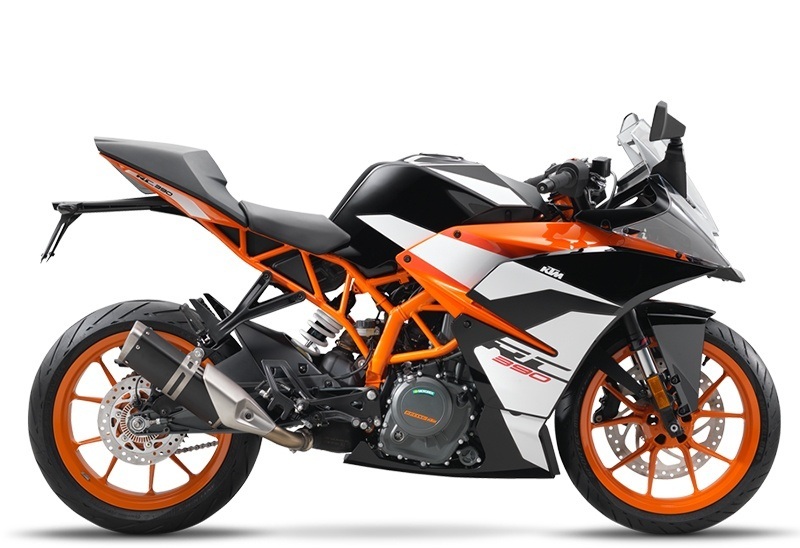 CHASSIS: Visually similar to the lightweight and approved Duke steel trellis frame, the orange painted frame has been modified to better fit the supersport ergonomics and dynamics. The increase of the steering head angle to 66.5 degree resulted in a shorter trail, shorter wheelbase and increased ground clearance. All these modifications release the complete racing potential of the RC and guarantee quick, agile and playful handling. TRIPLE CLAMPS: The forged aluminum triple clamps are eye-catchers and together with the clip on handlebars guarantee a pure supersport racing feeling. ENGINE & EXHAUST: The KTM RC 390's state-of-the-art, single-cylinder engine with twin overhead camshafts once again underlines KTM's development strength. ENGINE: The latest materials and production technologies not only deliver the bike's bountiful torque and punchy acceleration, but also good manners in everyday use and outstanding fuel economy. And thanks to the balancer shaft, this Euro 4 compliant single is as smooth as it is strong. POWER & TORQUE: A bike as compact and nimble as this one, deserves to pack a solid punch. With 32 kW (44 hp) and a dry weight of just 149 kg, we did it justice. Thanks to the ingenious intake and exhaust system, the 46 mm throttle body and the meticulous fuel injection system, this strong stroker is ready to leave the rest of the traffic behind at the twist of your wrist. CYLINDER HEAD: Exactly like they did in the RC8 R, the four valves in the cylinder head of the RC 390 are actuated by two overhead camshafts and ultra hard, carbon coated cam followers, providing reliability and longevity despite the engine’s high power output. SLIPPER CLUTCH: Not only does the slipper clutch open when the engine back-torque becomes too high, it also assists when you open up the throttle. The former prevents annoying rear wheel chatter when braking sharply or decelerating – and gives the wheel just that bit of braking for a controlled rear wheel slide. The latter allows the clutch to be pulled and controlled with just one trigger-happy finger – which saves energy when riding. RIDE-BY-WIRE: It’s the guarantee of a smooth throttle response, more than simply the absence of a throttle cable. The RC 390’s ride by wire ensures perfect application of the readily available and plentiful torque. It also electronically translates the throttle commands of the rider into throttle valve positions perfectly suited to the riding conditions. A2 LICENSE: The KTM RC 390 matches all the A2 driver´s license requirements and thanks to its high power-to-weight ratio, it’s one of the most dynamic options out there for new riders. EXHAUST: The RC 390 is equipped with a side exhaust, including link pipe and silencer. ERGONOMICS & COMFORT: The KTM RC provides racing riding position and freedom of body movement while preserving the comfort needed for every day usage. Unsurpassed operability and large contact surfaces ensure optimum control and maximum feedback, for maximum cornering fun all day long. HANDLEBAR: The clip on handlebars and switches contribute to a sporty and aggressive riding position combined with advanced control. SEATS: The two-part seat offers first class supersport ergonomics with perfect support for rider and pillion. With a seat height of 820 mm it enables the rider to have a secure stand while also being high enough for sporty use and real big-bike feeling. WINDSHIELD: The advanced design windshield in combination with the aerodynamic optimized motorcycle front ensures an incredible wind protection for rider’s chest and arms. FUEL TANK: A steel fuel tank with 10 l capacity (including 1.5l reserve) has been developed for the RC, perfectly matching the supersport style and vehicle design, together with rider ergonomics. Thanks to the economic engine, the RC achieves even in the sportiest manner of riding a considerable range. SOFTWARE & ELECTRONICS: Highly sophisticated electronics are wrapped around this RC. The variety of the the high-end technical implementation reflects the high quality standards of the RC. ABS: With ABS equipped as standard, every RC 390 demonstrates KTM's commitment to safety even in the small capacity class. As always the RC 390 is Ready to Race with the option to disengage the ABS system. TELESCOPIC FORK: The KTM RC 390 high-quality upside-down fork from WP Suspension has the same 43 mm outer tube diameter as the RC8 R – in other words, real racing equipment that guarantees highest levels of stability and precision. WHEELS: Equally lightweight as they are stable, the 17 inch orange painted cast light alloy wheels sized 110 mm wide at the front and an impressive 150 mm at the rear. The tyres impress with tremendous grip in both wet and dry conditions, as well as providing supreme durability.